In the Dark of the Night is a horror novel about a family that makes an unfortunate choice of holiday home. Every summer Kent Newell and Tad Sparkes go to Wisconsin with their parents and spend the holiday in houses beside the lake. And each year when his friends have headed off for some summer fun by the waterside Eric Brewster and his sister Marci have to stay home in Evanston. This year it is going to be different. Kent’s mother, Ellen, has found the Brewsters a house to rent. It is called Pinecrest and has stood empty since its former owner, Dr Darby, disappeared seven years ago. Merrill Brewster is a constant worrier. She thinks that Pinecrest looks like a witch’s house and tries to come up with reasons why her family cannot rent it. Dan Brewster, however, has no such reservations about the house. Next year Eric will be working and getting ready for college and so Dan sees this year as their last chance for a proper family holiday. Pinecrest is a spooky, old house, but the realtor has got the place looking rather cosy inside by the time the Brewsters arrive. Merrill still has her doubts about the whole thing of course, but she wouldn’t be Merrill if she didn’t. Marcie Brewster is also less than keen on the house and voices her mother’s unspoken words that it looks like a witch’s house, even if it does have a fantastic view of the lake. There is an old carriage house within the grounds of Pinecrest and a lot of Dr Darby’s old junk has been shifted there out of the way. It is not long before Eric begins exploring among the old furniture and boxes in the carriage house and as he becomes more and more intrigued by the strange assortment of odds and ends, he looses all track of time. It feels like he has been in there for only a few minutes when in actual fact it has been over half an hour. Strange indeed. When Eric returns to the carriage house later on he is accompanied by Kent and Tad. They are also fascinated by the things they find there and all three boys discover that time in the carriage house seems to be a law unto itself. The boys eventually discover an old door hidden behind a piece of plywood. As a further guarantee against intruders the doorway has been bricked up. But boys will be boys and these boys decide to investigate – feel a strange compulsion, in fact, to investigate. They remove the bricks from the doorway and find a further assortment of old junk: a table with a missing leg, a saw without a blade, a lamp without a shade and an axe that is missing its head. The boys also find a ledger that records the purchase of all these items, and discover that Dr Darby paid an awful lot of money for all the old junk. The hidden room quickly becomes a dangerous obsession and when strange things start happening around the lakes the boys share a feeling that there is a connection between the secret room and the occurrences, which are rather sinister in nature. First the Brewsters’ cat is eviscerated, then a local boy disappears, then . . . then things get bad. Most of the characters in In the Dark of the Night are pretty easy to like, but some like, local lad, Adam Mosler are a real pain in the behind. Adam and his gang spend a lot of time hassling Eric and his friends, or coneheads as they prefer to call them. Adam is not the nicest of guys and is probably not the kind of young man that most girls would want to take home to meet their parents. Young Cherry Stevens certainly shows no inclination of doing so. She is much more interested in Eric, which is probably a big part of the reason why Adam has such a problem with him. Eric has taken something that he not only wants, but sees as already belonging to him. This little love triangle forms one of the more interesting subplots in the book. One of my very favourite characters in the book was a dog—very old dog that was on its last legs. I really liked that dog, I didn’t like what happened to it though, but since it only lived on paper I suppose it is fair that it died on paper too—dashes to dashes, dots to dots, the writer giveth and the writer taketh away etc. In the Dark of the Night is 407 pages long and is quite an enthralling read. At first I had no idea what was going to happen, then after the incident with the cat, I began to form a theory about it all and, as it turned out, my theory was correct. Other readers might realize what is happening a lot quicker than I did, or, then again, not at all. It probably doesn’t matter either way though, because even when you do realize what the secret of the hidden room is, it is still hard to predict what is going to happen next and you will be already hooked into the story. 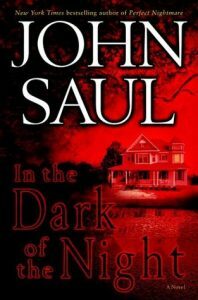 I was anyway and I certainly enjoyed spending some time discovering what secrets John Saul would reveal In the Dark of the Night.